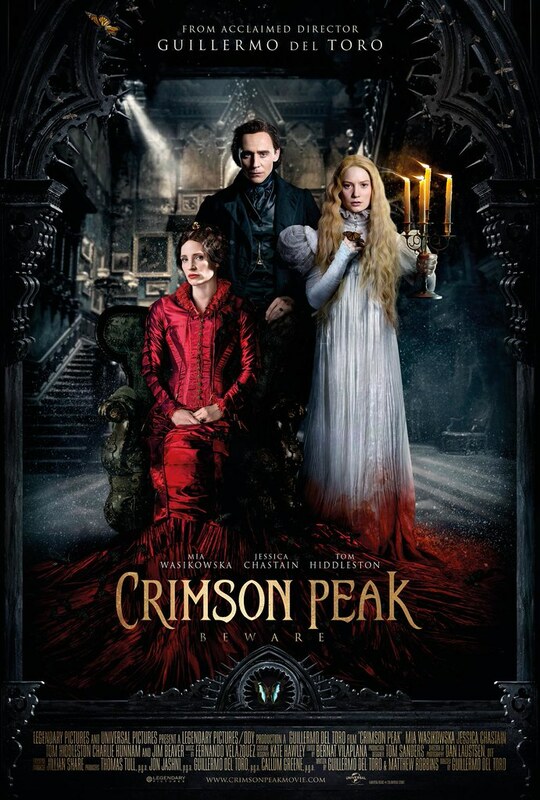 After marrying the charming and seductive Sir Thomas Sharpe (Tom Hiddleston), young Edith (Mia Wasikowska) finds herself swept away to his remote gothic mansion in the English hills. Also living there is Lady Lucille (Jessica Chastain), Thomas’ alluring sister and protector of her family’s dark secrets. Able to communicate with the dead, Edith tries to decipher the mystery behind the ghostly visions that haunt her new home. As she comes closer to the truth, Edith may learn that true monsters are made of flesh and blood. I never really like horror stories, but a gothic horror story is a different thing. Crimson Peak has some gothic in it and that’s what made it interested. I am not a gothic person, but I find gothic can be really interesting. Not to mention Tom Hiddleston is in this film and that’s already the highest motivation for me to watch Crimson Peak. You see, Tom Hiddleston is my favourite actor slash celebrity crush, so I don’t want to miss any of his films. 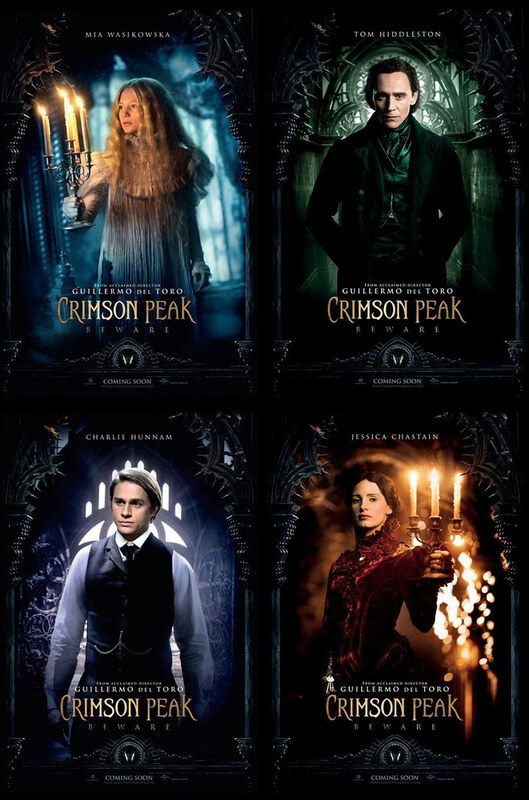 The overall story of Crimson Peak is not bad. However, the ending is rather ended quickly and I don’t particularly like it, to be honest. Since I am not a fan of horror films, I don’t mind the lacking of horror and scary scenes and all. What I don’t really like is perhaps how the story goes by the end of the film. Kind of disappointing, I must say. On the other hand, I really like the setting of the film. It was really really good. The manor was really fascinating, even though it’s kind of spooky. Nonetheless, they did manage to make beautiful scenes from it. The manor was indeed beautifully set. Perhaps the definition of beautiful here between you and me is rather different, but yep, I did find it beautiful in some ways. Although I don’t like horror or spooky things, I do have a thing with classic things, from architecture, clothes, even small things like calligraphy, letters, and so on. 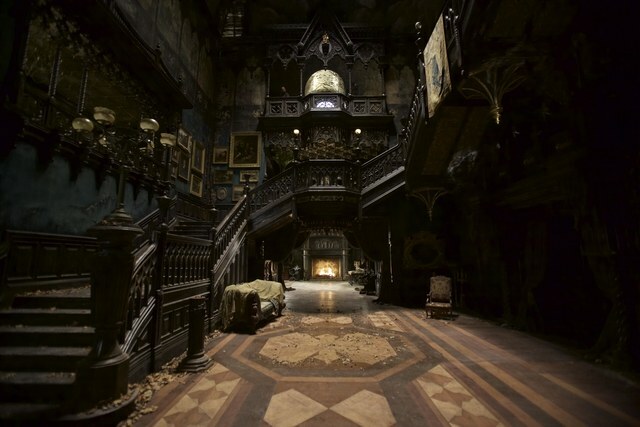 And to me, the manor in Crimson Peak is kind of classic and Victorian age like. I always love things from the Victorian age. As for the costumes in this film, I think they look great. As I said before, I love classic Victorian age things and in Crimson Peak, the costumes look classic and pretty much like the Victorian era. I think it must be fun to be able to try them once in a lifetime. Every costume is designed beautifully and fit the scenes and the story perfectly. What I really like about Crimson Peak is, of course, the presence of Tom Hiddleston. He is so charming. His voice is intoxicating. I really love watching the scene where his character, Thomas, has a waltz with Edith who is portrayed by Mia Wasikowska. I literally have watched that scene 25 times—yeah, I am not kidding about that. I think it was because I love Waltz and I love Tom Hiddleston. The combinations are so perfect together. You see, there are some actors who pretended they can dance but I found them rather stiff, not obvious of course, but it just caught my eyes. However, Hiddleston’s moves are just natural. You can see that he can actually dance. The movements are so smooth and flexible. The way he brought himself is no lie. And I always love guys who can do the waltz and Tom Hiddleston can do it perfectly. Now you see why he’s my celebrity crush, right? He’s not just handsome, talented, has an intoxicating voice, mesmerising blue-green eyes, adorable laugh, 1.88 meters tall, jaw-dropping cheekbones, very polite, and has gentleman attitude. Tom Hiddleston is actually can dance! Not to mention he is also good at speaking many languages, good at making impressions of other people, good in music and sports. He’s just a total package. A true gentleman. Anyway, I’m way off the road now, so let’s get back to Crimson Peak. Tom Hiddleston’s character in this film was indeed interesting and mysterious. I could see the love he’s shown towards Edith just through his piercing eyes. Hiddleston really pulled it off. As for Wasikowska, she also did a great job, although I must admit, Jessica Chastain’s character is more interesting than Wasikowska’s. To my amusement, Chastain didn’t play piano in real life, but she learnt to play piano in this film. So every scene where Chastain’s character, Lucille, played the piano, Chastain really played the piano by herself. Isn’t she great? As for the ghost, I don’t what to say. It’s scary and frightening first but later on, I’m getting used to it. In horror aspect, they did manage to scare us at first but after several times, I wasn’t scared anymore. Crimson Peak really has provided a different aspect of a horror story. The haunting house may not be like The Conjuring (2013), but it certainly scary. It’s a gothic romance. With a little bit of romance, everything can become more interesting. Guillermo del Toro certainly has done a great job. All in all, they have a strong background story, yet somehow the ending happened too soon so I don’t like that part. However, the actors and actresses are great, so does the setting and the costume. It’s just lack of wow ending. Crimson Peak is worth 7.5 out of 10 stars to me.